Why would teens go to the library to read poetry when they can easily be on Facebook, clicking away at their notifications? Why would teens read, or even write poetry, when they could be liking photos on Instagram or watching music videos on YouTube? Why would, and why should, youth treat poetry as relevant? As a teen myself, I've witnessed first-hand the life-changing and fulfilling effects of poetry. Not too long ago, I mounted the stage to read my poetry at a writing workshop, thinking anxiously to myself: Why did I ever volunteer to read my work in front of all these people?! More than being nervous about the quality of my poem, I felt anxious about what my voice would sound like. At the time, I was 14, and still suffering from a speech impediment that had affected me since I began talking. Would the audience understand me? Would they, like most people, wonder what foreign, exotic country I came from, and I would have to tell them that my accent wasn't an accent at all, but a disability? I clutched my journal tighter in my sweat drenched palms and prayed my clumsiness wouldn't emerge that instant, causing me to trip on my two left feet. As I stood, I experienced a sudden gratitude for the blinding lights. I couldn't see everyone's faces! That made things much easier. I opened my book and began to read. After the writing workshop, I gained the confidence to read my own work aloud. I learned that writing wasn't about pronunciation, but about style and the author's voice. This lesson helped me grow on endless occasions in my life -- during school, conferences, competitions, etc., convincing me that poetry can possess astonishing influence when taught to teens. But poetry didn't just help me; everyday organizations use poetry to aid more adolescents in some of the most important growing periods of their lives. One organization that I am part of, WriteGirl, through one-on-one mentoring and monthly creative writing workshops, gives girls the skills they need for a brighter future (the workshop I mentioned earlier actually occurred at a WriteGirl event!). 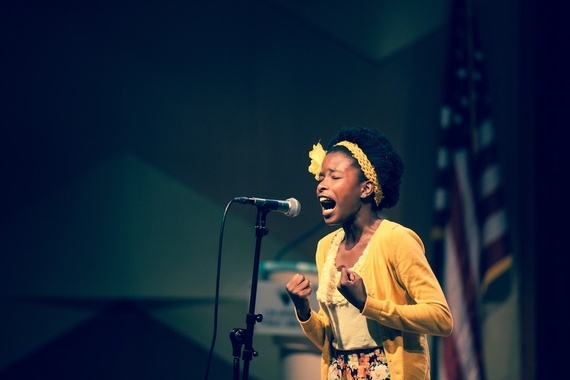 Although WriteGirl doesn't only focus on poetry, the organization still utilizes poetry to teach, inspire and empower girls all across Los Angeles. And it works! While the high school graduation rate in Los Angeles is only 80 percent (with a 78 percent rate for Latino students and 68 percent for black students), every year 100 percent of WriteGirl teen mentees not only graduate from high school, but move on to college. WriteGirl's success through creative writing mediums like poetry suggest that even if poetry isn't prevalent among all teens, it can be extremely relevant to their lives and aspirations. As a WriteGirl myself, you can call me biased, but WriteGirl is just one of the many Los Angeles organizations supporting youth participation in poetry. Get Lit, an organization that works in Southern California, "uses the performance of classic and spoken word poetry to increase teen literacy" (according to their website). With their extensive In-School, After School, Classic Slam and Get Lit Player programs, they "level the playing field between rich and poor, mainstream and marginalized, bringing previously unheard voices to the front." Through Get Lit's Next Step program, their teen performance troupe receives one-on-one college counseling, leading nearly 100 percent of the teens to go college and 70 percent to receive scholarships. Wow! All in all, this group success story demonstrates the beneficial properties of youth exploring poetry. But do these benefits become irrelevant with the fast-paced evolution of technology placed in young hands? I am all too familiar with moments in class where I am writing ideas in my worn journal, and I see all my peers engulfed in their phones. In a time of extensive access to technology, one could claim that poetry is as relevant as a wagon is to a car company. However, it seems quite the opposite: technology has opened a whole new realm for young poets and writers, as displayed by the endless blogging on Tumblr. On KidBlog, young students can post their poems as a blog post and their peers can leave comments. The Internet makes it easier to get poetry out, and also for viewers to read it. I myself could reread O, The Oprah Magazine's poetry issue with the click of a button. Moreover, spoken word artists continue to take full advantage of video, performing their poetry for uncountable audiences across YouTube. On SoundCloud, poets are recording their voices, while on VoiceThread, students can do the same thing and add illustrations. Social media provides an instant community for poets to discuss, promote and create. This just exhibits the tip of the iceberg when it comes to how technology serves as a resource for poetry. Many people are discovering, or rediscovering, that poetry is fun and creates many opportunities and mediums for self expression. With technology, poetry did not lose its relevance, but gained some. From this, we know at the very least that poetry is powerful. Youth is powerful. Combined, we produce enough power to change ourselves and change the world. Just as we wouldn't close our eyes to the past while trying to paint the future, we shouldn't disregard poetry in the face of technology. If anything, now we can explore poetry more than ever. As we do so, poetry grows and develops deeper significance. For youth, poetry means far more than rhymes, pages and pens. As I stepped up to that mic and dared to read my writing at the workshop, I learned that poetry is voice, and the courage to use it. With this courage, we free ourselves and become capable of influencing others. Consequently, poetry's influence on young and old, MacBook and PC owners, never seems to die, as its power refuses to weaken, but grows, with the passage of time.